Clearly good looks run in this family, as the XPS 14z is every bit as beautiful as its older brother. The brushed metal finish feels as solid as it looks – this laptop took a pounding in our rucksack and didn't have any scars to show for it. Even the impressively thin aluminium lid is firm enough to withstand plenty of abuse. It's as if Bruce Lee was reincarnated in laptop form, and clumsy users will love it. We were a little surprised when Dell announced a 14-inch version of its 15-inch laptop, expecting the difference in size to be minimal. However, the weight and bulk reduction is very impressive. At just a smidgen under 2kg, the XPS 14z is noticeably lighter than its sibling and actually a lot more compact. We also love the curved design of the backlit keyboard. The board is well-sized despite being housed in by the speakers, and comfortable to type on for long periods. The tiny arrow keys are the only casualty, crammed into a single row. Dell also claims the keyboard is spill-resistant, although we didn't have the guts to assault it with London's finest tap water. We also liked the spacious touchpad, which thankfully avoids the irritating integrated mouse buttons you find on many compact laptops. In fact, our only design complaint is the stiff lid hinges, and how the screen only tilts back 45 degrees from vertical. Finding a comfortable viewing angle can be tricky when the XPS 14z is sat on your lap. The dinky XPS 14z display isn't quite as sharp as the XPS 15z's, featuring a standard 1366 x 768-pixel resolution instead of Full HD, but movies and photos are still crisp and colouful. Sadly this screen is also dimmer, and viewing angles are surprisingly narrow. We weren't disappointed by the built-in speakers, which are once again powerful enough to fill a small room. Sound is a little tinny on top volume, so audiophiles will want to hook up an external pair, but if all you need is a little background music, you won't be disappointed. The Intel Core i5 Sandy Bridge processor performed typically well in our benchmarking tests. Even with tons of applications running at once, we saw no kind of slowdown, helped in some part by the generous 6GB of memory. Our model also packed an Nvidia GeForce GT 525M graphics card. This GPU is getting on a bit and we were disappointed by the stilted performance during testing. Recent games will stutter, unless you turn plunge detail levels right down. Thankfully HD movies play perfectly and video editing software also runs perfectly. 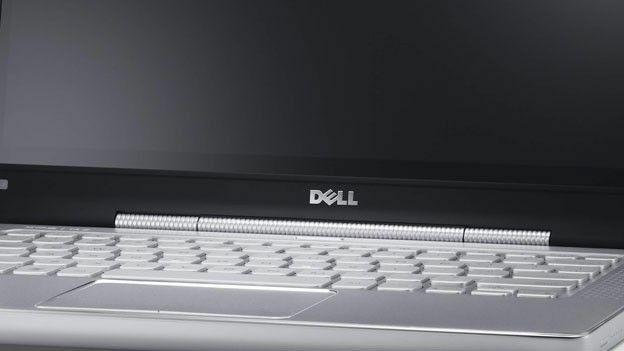 Despite packing some powerful components into a slender chassis, Dell has made a cool and quiet laptop. Only when we inserted a DVD did the XPS 14z make any noise, while the chassis keeps a good temperature as long as the vents are clear. The Dell XPS 15z boasted a surprisingly good battery life considering the excellent performance. We're pleased to say that the XPS 14z also has excellent staying power. Usually Sandy Bridge laptops are defeated by our ruthless Battery Eater test in under three hours, but this portable played HD video on loop for 200 minutes before kicking the bucket. This puts most other multimedia laptops to shame, and is just half an hour less than the XPS 15z managed. Regular travelers will want a sizeable hard drive for carrying their entire media collection around, and this laptop doesn't disappoint, packing in 500GB of storage. The drive spins at 7200rpm, faster than the standard 5400rpm, so software loads quickly and movies stream perfectly. The slender body also houses a slot-loading optical drive, so you can watch DVDs and install games from disc. Other features are limited to a 1.3MP webcam for chatting with friends and family. We were surprised by the lack of ports, with only two USB connections available (one of them USB 3.0). You also get HDMI and Mini DisplayPort connections for hooking up a television, but that's your lot. If you need a laptop to keep you entertained on the go, Dell's XPS 14z is one of the best around. A drool-worthy combo of portability and performance should keep even the fussiest consumer happy.